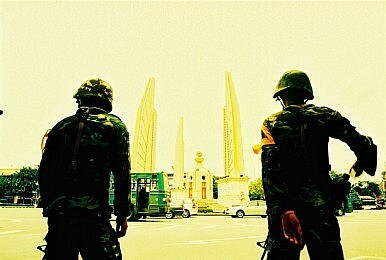 The EU should continue to stand up to Thai’s coup leaders and push for the restoration of democracy. There is a chance that Kritsuda Khunasen owes her freedom to Brussels. The 27-year-old red shirt activist was detained by security forces in Thailand’s Chonburi province in late May. For almost three weeks her whereabouts were unknown and rumors spread that she had been killed. Then, last Tuesday, the Thai military finally set her free. Kritsuda’s release came one day after the EU declared that it was reviewing its relations with Thailand following a meeting of the foreign ministers of its member states. In the announcement, the Council of the EU concluded that official visits between Thailand and the EU should be suspended and that the EU and its member states will not sign agreements with the country unless a democratically elected government is in place. It also urged the junta to free all political prisoners. “We will send information about their release, the situation of human rights, and our efforts to return Thailand to democracy to inform and create understanding with foreign countries, especially the EU members,” a spokesperson of the junta said according to the Thai newspaper Khaosod. In taking the gross human rights violations in Thailand seriously, the EU is finally starting to use its economic clout to effectively press for positive change. It is about time. More than one month after the military coup that deposed the democratically elected Phuea Thai government, it has become clear that the military is not the neutral arbitrator it presented itself as. In fact, a recent revelation by Suthep Thaugsuban, who led the anti-government protests in the months leading up to the coup, indicates that the military intervention had been long in the making. If Suthep is to be believed, the coup was the grand finale of a long-term scheme to get rid of the Phuea Thai government and the leading Shinawatra family. True, Suthep is an emotional braggart who likes to exaggerate (it is impossible to count the number of “final battles” he fought against the government, losing every time until the military stepped in). But it is not implausible that junta-leader General Prayuth Chan-ocha and Suthep had indeed been collaborating for some time now. The EU is right to send a strong message against such a sustained attack on democracy, freedom, and the rule of law. Even though a large number of Thais appreciate the viciously enforced calm that now prevails in post-coup Thailand, the conditions of those who think differently has become unbearable. The junta is organizing witch hunts and hands out rewards to people who provide information on anti-coup activists. According to the Global Post, critics of the coup are now risk being detained for simply for reading George Orwell’s 1984 in public or for eating sandwiches. Meanwhile, flashing the three-fingers salute from the dystopian movie “The Hunger Games” can land you in jail as well. Thailand’s generals think theirs is the only truth and have adopted a type of paternalism that violates the most fundamental rights of Thai citizens. Thailand has long been a friend of Europe. But if a friend mistreats his children and locks them up to create a false sense of unity in the family, you don’t go and visit him anymore. And you don’t do business with him. Like a father who justifies his use of violence as an educational measure, the junta thinks that it can “inform” the West about its good intentions by using its diplomatic and media channels. In that context, Kritsuda’s claim to be “happier than words can say” – probably uttered under duress in an awkward TV appearance after her release – may have been squeezed out of her to pacify an international audience. The EU, nevertheless, does not seem to believe in fairy tales and the military’s happiness campaign. One futile attempt at promoting the coup was recently made by a Thai diplomat in Brussels, Chulamanee Chartsuwan. She asked the organizers of a panel discussion on human rights to exclude well-known Thai academic Pavin Chachavalpongpun from the event. Pavin, an outspoken critic of the coup and of the country’s traditional institutions, is currently facing an arrest warrant issued by the junta. Eventually, Pavin took part in the panel via video conference and in defiance of Chulamanee’s lobbying efforts. He exposed the absurdity of the military’s diplomatic efforts by starting to read The King Never Smiles, a myth-shattering book on the evil side of King Bhumibol’s reign, when Chulamanee began to praise the Thai monarchy during the Q&A session. “To those of you who justify and promote the coup while sitting in this room right in the heart of Brussels: You should be ashamed of yourself. I would like to condemn you!” Pavin said in response. Brussels was listening and issued its own condemnation a week later. By suspending the conclusion of important cooperation agreements with Thailand, the EU, however, has yet to impress the Thai business sector. At a recent event in Berlin on the ASEAN Economic Community, a representative of the Thai National Shippers Council highlighted the positive effects the coup has had on business operations. “The military government is a dictatorship. They can make quick decisions and we business people can effectively lobby them. So we can make business faster.” The economic effects of international disengagement did not seem to weigh too heavy on his mind. Although he added that, politically, the coup was wrong, it took guts to defend the economic policy of the junta in a room right next to Berlin’s Brandenburg Gate, a symbol of freedom and of the collapse of another authoritarian regime which broke down because it was deaf to the voice of its people and because of economic instability that was partly due to international isolation. Nonetheless, Thai capitalists do not seem too bothered. According to a recent report, the private sector expects only limited effects of the EU’s decision. However, the EU is the country’s third largest export market and with the likely departure of Thailand from the EU’s Generalized System of Preferences (GSP) and higher tariffs due next year, only a free-trade agreement can ensure that Thailand continues to enjoy privileged access. Although the EU has its own interest in boosting trade with ASEAN’s second largest economy – as recently as in late 2013 the European Commission announced that it needs to “step up its relations with the country” – the suspension of the Partnership and Cooperation Agreement and, in all likelihood, of FTA negotiations will certainly have an impact on Thailand. The planned extension of FTAs to other Southeast Asian countries, notably Malaysia and Vietnam, after the successful conclusion of an FTA with Singapore in 2012, is on the EU’s official agenda as outlined in its “Guidelines on the EU’s Foreign and Security Policy in East Asia.” Against this backdrop, Thailand might soon lose competitiveness to neighboring states. Predictably, key players in the Thai private sector are playing the China card in response to the EU. As their argument goes, China would make up for the decline of exports to Europe. Politically, the junta has already fostered closer ties with China amid criticism of the coup from Western countries. In mid-June a Thai military delegation visited China while the Chinese ambassador reportedly praised the junta for reviving business confidence in the country. In this context, it may appear counterintuitive to isolate Thailand. Nobody wants to risk driving a long-term ally into the arms of China. But, then again, it is very unlikely that Thailand is willing to actually move in that direction. The country has too much to lose from cutting its longstanding and lucrative ties with the West and it has usually pragmatically sought a balance in its foreign relations. Thailand, whose conservative guardians translate “Thai” as meaning “free” and harbor a superiority complex towards its formerly colonized neighbors, will not want to again become China’s tributary state. Although East Asian culture has been a huge success in Thailand over the past few decades, it has usually been the cultural exports of successful democratic countries that caught the attention of the Thai people, like J-Pop in the 1990s and Korean soap operas and hairstyles in the 2000s. A corresponding China-wave does not seem to be on the horizon yet. So Thailand won’t be lost even if the EU were to take stronger actions in the coming months. If Europe takes its Asia strategy as sketched in its policy guidelines seriously, it should indeed “consider further possible measures” as the Council warned in its conclusion on Thailand. The development and consolidation of democracy and the rule of law is a declared cornerstone of Europe’s regional agenda. Therefore, the EU must continue to move from a narrow approach to Asia based on trade relations to one that effectively promotes open and free political systems and societies. To this end, it should use its economic leverage to make its presence felt. As a region once torn by wars and ruled by some of the most vicious leaders in world history, the EU today has lessons to offer. Helping the Thai military junta to consolidate its power by doing business with it would be a slap in the face of those who defend the values the EU stands for. The generals should not be allowed to portray themselves as economic stabilizers when it was the military and other conservative forces that destabilized Thailand in the first place. And even from a purely economic perspective, Europe should have an interest in seeing the country develop into a stable and rule-based society with a predictable investment climate. Thailand therefore provides a testing ground for the seriousness of the EU’s engagement in Asia, as it is about time for a European “pivot” to the region. The country is of utmost importance to regional developments. For those who want to see democratic consolidation in Southeast Asia, Thailand was once a source of hope. Now it is a source of despair. Already people in countries like Myanmar and Vietnam are looking at Thailand’s chaos and saying: “If that’s what democracy leads to, we don’t want democracy.” They do not see Thailand’s problems as the result of constant military interventions that prevented the maturation of Thai democracy. They see it as resulting from the democratic processes themselves. If constitutional rule in Thailand cannot be restored soon, the failure of democracy in the country will send a strong and worrying signal to the region. It is therefore important for Europeans to look beyond postcard images of beaches and long-tail boats when thinking about Thailand, and for Europe’s economies to reconsider their perception of the country as a mere source of electronic equipment, machine parts, and exotic fruits. They must see Thailand for what it is: a nation of strategic importance. Serhat Ünaldi is Project Manager in the Bertelsmann Stiftung’s Germany and Asia program. He has recently completed a doctorate at Humboldt-University in Berlin, where he worked on the Thai political crisis. It's been one year since Thailand's coup, and there are no signs of democracy's return.